Peel the pumpkin (in case of Hokkaido or Delica bio you can also use the peel and remove only the seeds) and cut it into cubes: the smaller before they will cook. Saute the leeks in a large pan with a little oil, when it is soft, add the diced pumpkin, chopped rosemary needles, curry (or pepper), salt, a glass of water, then stir and cover with a lid. United towards the end of cooking the potatoes steamed, stir thoroughly and cook a few more minutes so that all the flavors can blend well with each other. As an alternative to the standard that I use usually, this time I prepared it by mixing the soy cream with coconut cream, 2 tablespoons of olive oil, two of shoyu and two of nutritional yeast flakes. I emulsified everything carefully and then used this alternative béchamel sauce to cover the conchiglioni in order to brown them in oven. The use of coconut cream for this sauce, together with curry used for the filling, gave this dish a pleasant exotic touch which was much appreciated. 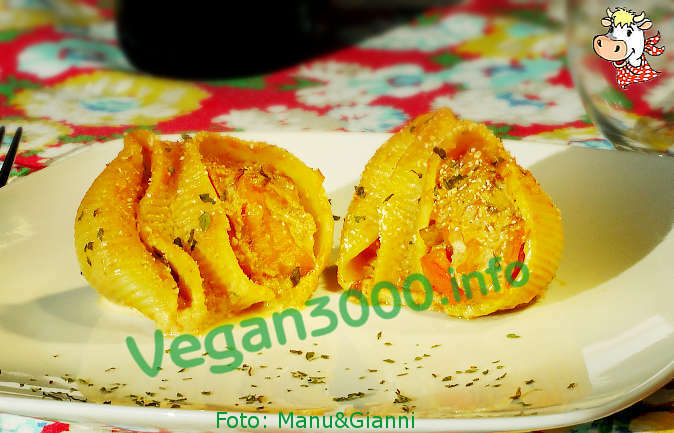 After having boiled the conchiglioni in boiling salted water, fill them with the mixture of pumpkin, potatoes and leeks, place them one by one in an oiled baking sheet and cover with the sauce that you prepared in the meantime. Finish with a light dusting of nutritional yeast flakes and bread crumbs on the surface, in order to obtain a gratin. Bake at 190° C for 15-20 minutes and serve hot.